South Korea will break ground to expand bullet train system in outer Seoul in hopes to alleviate commuting problems in capital region. 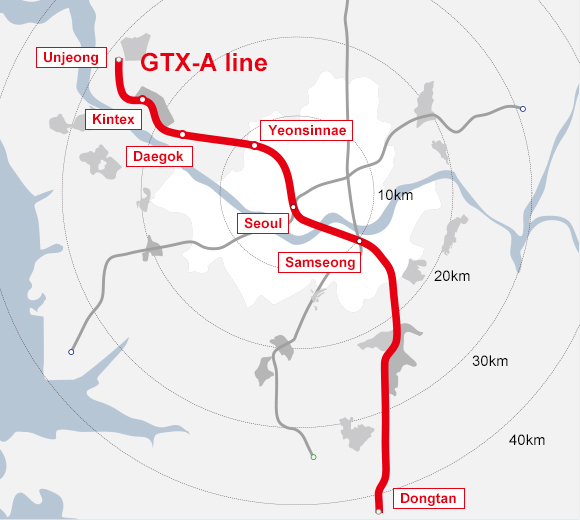 The groundbreaking ceremony for GTX-A Line will be held on Thursday at Kintex in Goyang, Gyeonggi Province, the Ministry of Land, Infrastructure and Transport announced Wednesday. GTX, the city-wide high-speed rail network, is currently under expansion to support long-distance commuters to and from Seoul in line with the government’s new suburban development project to ease the housing shortage in and around Seoul and tame the city’s runaway housing prices. Once the A Line connecting Paju, Gyeonggi Province, to southern Seoul is opened by late 2023 after an estimated 60 months-long construction, commuting hours are expected to be cut by 70 to 80 percent – 20 minutes from Unjeong, Paju, to Seoul station, central Seoul, 16 minutes from Kintex, Goyang, to Seoul station, and 22 minutes from Dongtan, Hwaseong, to Samseong station, southern Seoul. Check out a video summary of the project (Korean).